Mary Ellen Doyle's paintings based on the landscapes of the East End of Long Island and the architecture of New York City have been praised by critics, acquired by private collectors, and chosen by museums for their permanent collections over the past 30 years. Her artwork evolved in New York in her Union Square studio, where her view of watertowers and ancient facades inspired her to create architectural images in her chosen medium of lithopencil and watercolor on handmade paper. 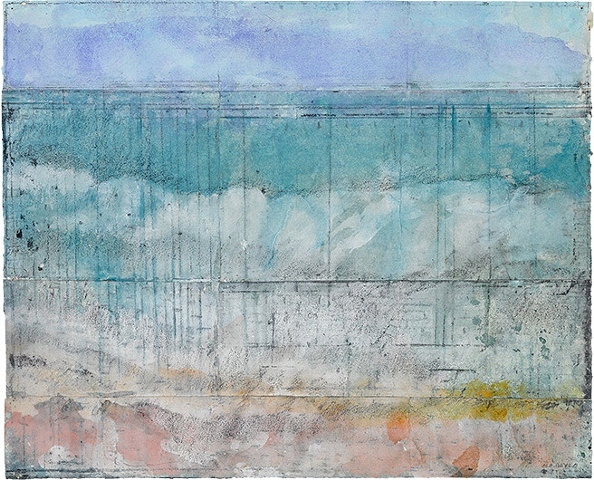 With appreciation of Diebenkorn, she incorporated this content into landscapes after she established her second studio on the East End of Long Island. There she was stimulated to work directly from nature, in the tradition of Cézanne, at the ocean, the fields, and in her studio overlooking preserved farmland. Born in Hartford, Connecticut in 1938, Mary Ellen Doyle began studying watercolor painting in summers on Cape Cod. Working outdoors, she produced paintings that were exhibited at the Wadsworth Atheneum in Hartford in 1955 and 1956. Ultimately her work was included in that museum's permanent collection. After high school at Oxford School, her education continued with two years at Vassar College, a year in England at the Ruskin School of Drawing, and a B.F.A., 1962, in painting and drawing at Boston University College of Fine Arts, where she was given the Distinguished Alumna Award for Visual Arts in 2000. This honor came after her 1997 exhibition of watercolors at The Phillips Collection, Washington D.C. Her show, Towards the Horizon, 1999-2000 traveled to art museums in Columbus, Georgia, Jackson, Mississippi, and Montgomery, Alabama. One-person shows were originated from 1992 until 2002, by Susan Conway Gallery in Washington D.C and Santa Fe, New Mexico. Ongoing recognition of Mary Ellen Doyle's watercolor paintings in the form of museum acquisitions is evidenced in the list of permanent collections which have her work; such as, The Phillips Collection, The National Museum of American Art, Smithsonian Institution, Achenbach Foundation for the Graphic Arts, Fine Arts Museums of San Francisco, The Albuquerque Museum, and others. Mary Ellen Doyle continues to create her paintings that combine the order and structure of abstraction with the space and light of reality.